I wish I could have read “Why Motivating People Doesn’t Work…and What Does” by Susan Fowler at the start of my career. It would have been helpful to not only learn the concepts but also to be coached in their practice. I have gleaned some of this information from mentors and coaches, such as: “money is only a de-motivator”. and “when you meet with your direct reports, it is about them, not you”. 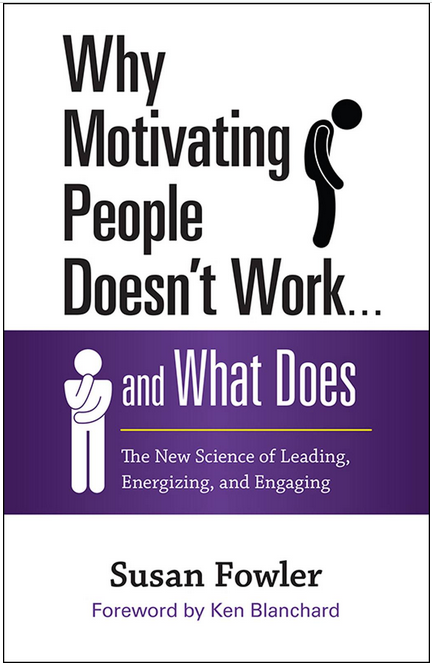 This book places these concepts into an organized framework that lays out step-by-step how to improve engagement and performance without using tired and counter-productive concepts that we have been told will “motivate” employees. In education there is a rising emphasis on test scores and there is a rising backlash against them, I could never quite describe my instinct that bashing teachers for delivering poor test scores is completely counter-productive. This book explains why. An old sports analogy works equally well in business: focusing on profit is like playing the game with your eye on the scoreboard instead of the ball. Substitute “education” for “business” and “test scores” for “profit”, and the quote works just as well. So what does motivate employees (and, by extension, students)? Autonomy, relationships, and competence. The book delves deeply into each concept and it provides practical advice about how to put them into practice.